Inova Silverline automatic gates combine the reliability of our Inova drive, safe technology and the technical advantage of aluminium construction. Distinctive – Up to 15m freestanding clearance width. Easy to Use – Simple opening and closing operation of aluminium gate. Cost-Effective -Innovative patented design principle. Certainty – Activation cards and photoelectric switches are the industry standard. These automatic gates are manufactured as a modular design. This means that the lower beam profile is made up of a small number of combined profiles which is very cost-effective. 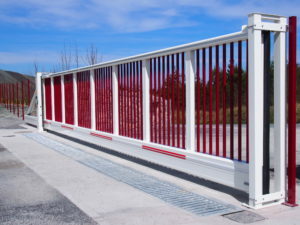 Through this patented design principle the lower gate beam varies from 200mm to 440mm for the light transit widths of up to 15m clear opening. The Silverline automatic gate engine is protected in the lower beam manipulations and ensures sufficient power reserves for a reliable operation even in adverse weather conditions.